You don't need coddling; you don't need to be told what you already know. What you need is a book that uses your experience as a Java or C++ programmer to give you a leg up into the challenges and rewards of C#. And this Practical Guide is precisely what you're after. Written by a team that boasts extensive experience teaching C# to professionals, this book provides a practical, efficient explanat… ion of the language itself, covering basic to advanced features and calling out all that's new in 2.0. 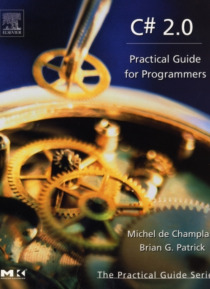 Its instruction is always firmly situated within the context of the .NET framework and bolstered by code examples, key lessons in object-oriented programming, and installments of a realistic application programming tutorial. Concise and incisive, this is the best way to master the world's fastest-growing and most marketable programming language. Features: Provides a carefully focused explanation of every aspect of the C# language, including entire chapters on the unified type system, advanced types, collections, generics, reflection and attributes.Highlights all features new to the latest version of C# and organizes its presentation of C# according to the key principles of object-oriented programming and the .NET framework.Using end-of-chapter exercises, incrementally develops a cohesive application programming tutorial. Provides a carefully focused explanation of every aspect of the C# language, including entire chapters on the unified type system, advanced types, collections, generics, reflection and attributes.Highlights all features new to the latest version of C# and organizes its presentation of C# according to the key principles of object-oriented programming and the .NET framework.Using end-of-chapter exercises, incrementally develops a cohesive application programming tutorial.